The Best Night is Volume One's big annual party celebrating our Best of the Chippewa Valley reader poll and the Chippewa Valley Vanguard Awards with food, drinks, live DJs, roving performers, art installations, and more – and this year featured the Confetti Cannon Slo-Mo Video Booth of Fantastic Good Times (working title). We invited guests into the booth and we displayed their shenanigans outside – in high definition – for all to enjoy. Here's a montage of the fun. 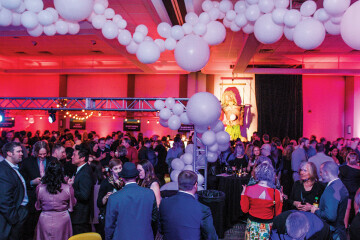 Our sold-out 2019 installment of The Best Night took place on Saturday, February 9 at The Lismore in downtown Eau Claire.